Earlier this month, St. Anthony of Padua Catholic School hosted its first ever Honors Program Ceremony in St. Michael the Archangel Chapel. The ceremony celebrated students whose grade average was 85 or above for the first semester. Additionally, high honors and special recognitions were given to those students with a grade average of 91 or above. The atmosphere in the chapel was electric, and we were also excited to see such a big turnout of parents, who occupied over half of the chapel! 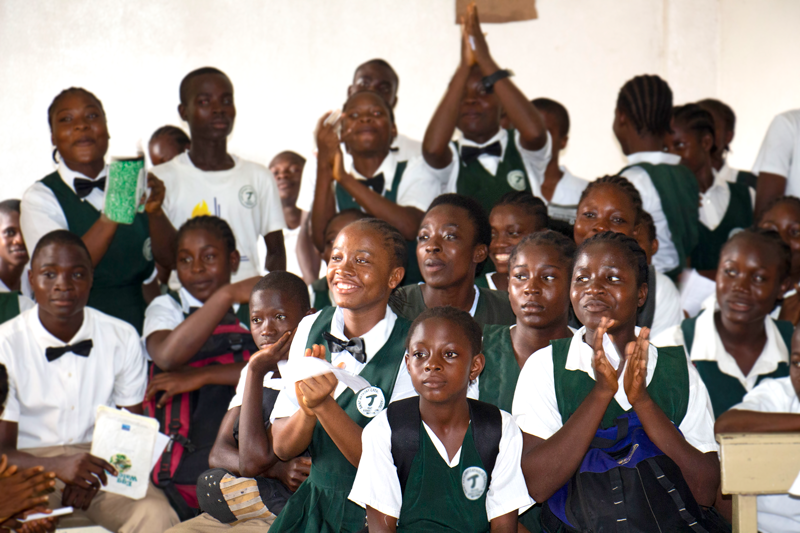 At the beginning of the program, the school administration informed all in attendance that good grades would not go unnoticed at St. Anthony’s. At the end of the school year, anyone having a 91 or above cumulative average for the year 2018/2019 would receive a full tuition scholarship for the following academic year! Anyone having between 85-91 would receive a half-tuition scholarship. 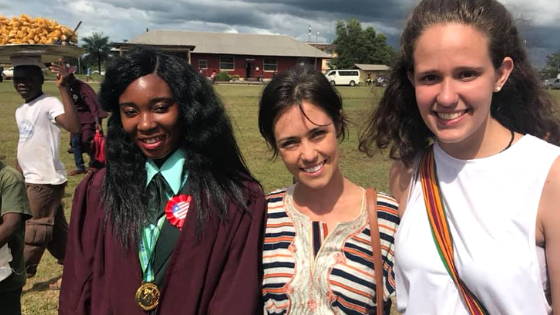 Also, any 9th grader having a 91 or above for the year would receive a full tuition scholarship to the Booker Washington Institute (Liberia’s premiere vocational high school, where most of our sponsored high school students go). Before certificates were handed out, a number of honorees showcased their knowledge and skills with poem recitations, song solos, and various speeches that highlighted different aspects of the education they have received at St. Anthony’s. All in attendance—especially the parents—were visibly impressed as the students displayed their gift for learning. Finally, it was time to recognize the honors students. Proud parents rushed to embrace their children as they received their certificates. Many pictures were taken and many tears of joy were shed. We are grateful to God for the spirit of joy shared during the ceremony and all the hard work our students put in to get good grades! On Saturday, March 30, we had a Lenten retreat and day of fun at the beach. We took all of our residential students, along with some of our high schoolers, house parents, and missionaries, to the Assunta House. This house belongs to some of our community friends from another Franciscan missionary order. They were so kind to let us use their compound for our retreat. We left early in the morning for the retreat. We we arrived at Assunta House, we joined together for morning prayers. Our theme for the retreat was, “God Speaks in the Silence of the Heart” because sometimes our lives are so noisy that we miss the opportunity to hear from God. We listened to missionaries share on the importance of silence based on their own personal experiences. Our main activity for the retreat was forty-five minutes of silence. Everyone found personal space on the property where they prayed and reflected on questions we were each given. When we joined back together, we shared our answers and were overwhelmed by the beauty and positivity in the responses shared. God filled us with peace and joy as we spent time with Him. After our closing prayer, we ate delicious plates of jollof rice and fried chicken. Then it was off to the beach! Everybody changed into beach clothes and we gathered on the shore for a walking rosary. When the rosary was finished, everybody enjoyed the beach and ice cream. We played soccer on the sand and swam in the ocean for hours. When we were all tired from a wonderful day, we decided to head back to the mission. We thanked the employees who worked extra hours at the Assunta House so we could have an amazing experience. It was such a rejuvenating day full of prayer, good food, and fun. This Lent, we thank God for His goodness and His voice that speaks to us in the silence of our hearts! Claire helping prepare our grounds for our 15th anniversary celebration in November. During my sophomore year of high school, the Caudle family who I knew from church, moved to Liberia Mission for 2 years (Greg Caudle was Liberia Mission’s former Director). They packed up their family of 6, left their jobs, and came to Liberia. They were so excited about coming to Liberia Mission, that they made the whole process seem easy. I think that was the same time that God started working on me. By the time all of my peers were deciding where they were going to attend college, I had decided to take a year off. I graduated in May 2018 and left for Liberia in August. I have been in Liberia for 5 months now, and I’ll be here for one more month. My time here has been so exhilarating that it feels like I’ve only been here a month, and the sadness of my coming departure is slowly growing. I’m often asked about what I like best about living here, but I never have an answer. There’s simply too much here to love. If Liberia Mission had a marketing brochure, I’m sure it would provide the details of the residential program for the poorest of the poor, the school for 435 students, and the Catholic values that inform all that we do. But what’s far more difficult to describe is the excitement that fills this place, the community culture that cultivates personal growth, the energy of the students, and the unconditional love we have for one another. 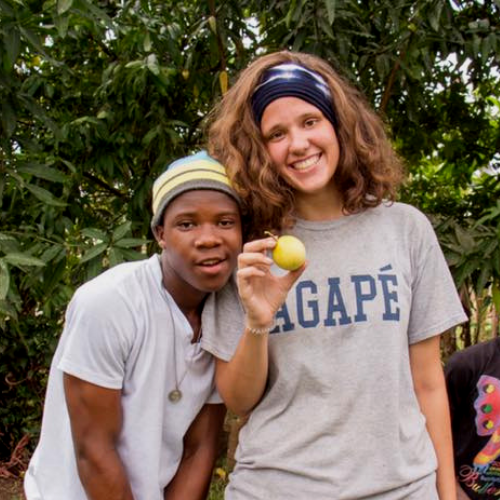 Claire picking fruit on Liberia Mission’s farm. My days here on the mission are spent in a wide variety of ways. I don’t have a specific job but I help kids with homework during study hall time, work on short term projects, and assist in the office. I sometimes “help” in the kitchen, where I’ve learned a lot about African cooking. Then there are all the things that would have worried me if I had known about them before I came. From being awakened by a rooster or a donkey, to the persistent ant bites and the constant heat, I see that it’s these differences that make living here so special. When you add in Saturday water fights, volleyball, working in the community outside our walls, and quiet evening conversations, living here feels like paradise. There were some routines I was not prepared for, like waking up at 5:00 for Morning Prayer, but the longer I am here, the more I love them. When our voices break the morning silence, God is present. Coming half way around the world has not been easy every step of the way, but it has given me the opportunity to see how people outside of where I have grown up live. I have seen a single motorbike carrying an entire family, gas stands selling fuel from old mayonnaise jars, and people living in houses made from corrugated zinc. I’ve also seen people filled with a joy so uncontrolled that they break into song and dance. Claire (on right) with Grace, our Financial Manager, celebrating graduation at Booker Washington Institute. There is so much more I could say about Liberia Mission and my experience here. I’ve learned to love all the pigs, cows, dogs and everything in between. I’ve felt God’s ever-present love through prayer and in worship. So when my day ends with three new ant bites and I’m longing to eat something other than rice, I think about how lucky I am to have had a day full of laughter, smiles, friends and unforgettable memories. I don’t know of any place else like Liberia Mission; it’s truly special and will forever hold a special place in my heart.